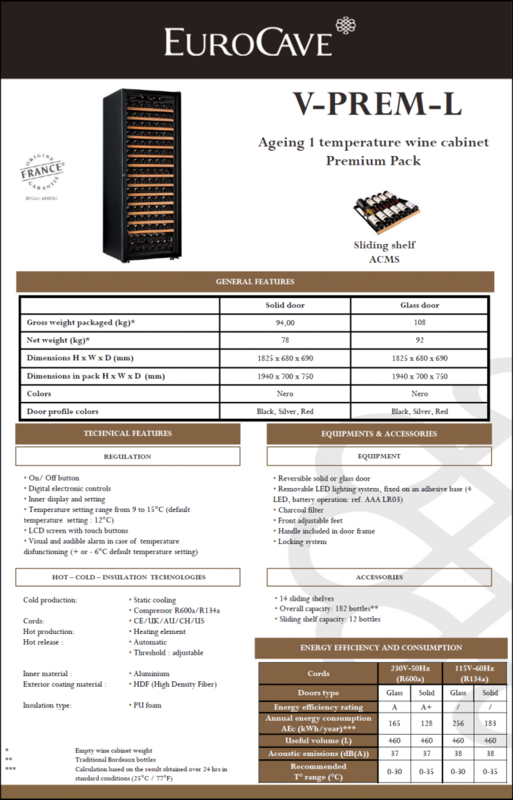 EURO PURE-L, PURE Vieillitheque Series by EuroCave - single temperature wine maturing cabinets. Internal Air Fan for air circulation and regulation of temperature throughout cabinet. The superior alarm function available on top models notifies of temperature or humidity issues, as well as need for filter change. The walls of the Euro Cave are all made of embossed aluminum. 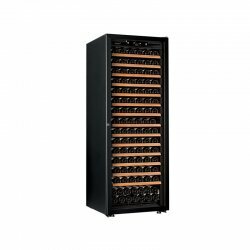 Embossed aluminum provides, better temperature distribution internally in the cabinet. Because aluminum is a conductor. Humidity is better retained with embossing on the interior walls. This eliminates water from flowing too rapidly within the walls and out to the back draining tank. · Insulation improved by more than 30%, meaning as much as 25% reduction in annual energy consumption. Superior anti-vibration for both the shelves and compressor. EuroCave works very hard to minimize vibration within the wine cave and has several layers of protection. The compressor is separated, evaportator is embedded in foam, racks have no direct contact with side walls and the shelves are designed for easy slide.